I think I'm finally finished with the frilly flower phase of my gardening life. I realized it when I walked through the garden yesterday evening checking out all the columbine (Aquilegia) blooms. 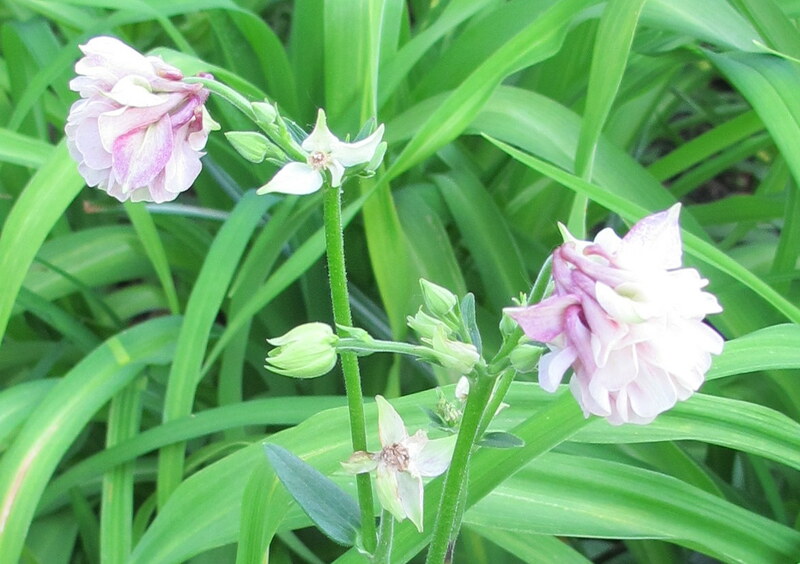 Most of the columbine in my garden sure are frilly. Foo-foo, even. Not quite like me, that's for sure. They have self-sown a bit around the garden so they come up here and there with some variation in their frilly flower colors. I just let them grow where they sow themselves. I have Aquilegia vulgaris 'Tower Pink' growing back by the compost bins. It's a volunteer seedling that showed up a couple of years ago and I just let it grow there. This spring it even survived the complete makeover of the Vegetable Garden Cathedral. I also have 'Black Barlow' blooming in Plopper's Field. I plopped it there a while back and forgot about it. It's hard to miss now, especially in bloom. Elsewhere 'Tower Blue' is blooming, too. This one came up in a hosta bed that doesn't have a name yet. "What," you say. There's a garden area in Carol's garden that doesn't have a name yet? Don't pressure me. I'll name it in due time. I might name it Hellebore Haven right now because it is also where the Helleborus are planted. We'll see. No rush. I'm now on the look out for single-flowering columbine, mostly to plant along Ridgewood Avenue, the path that divides Woodland Follies from August Dreams Garden. (Yes, those areas of the garden are named.) I bought a few last year, but they struggled a bit in the drought. I need a lot more. 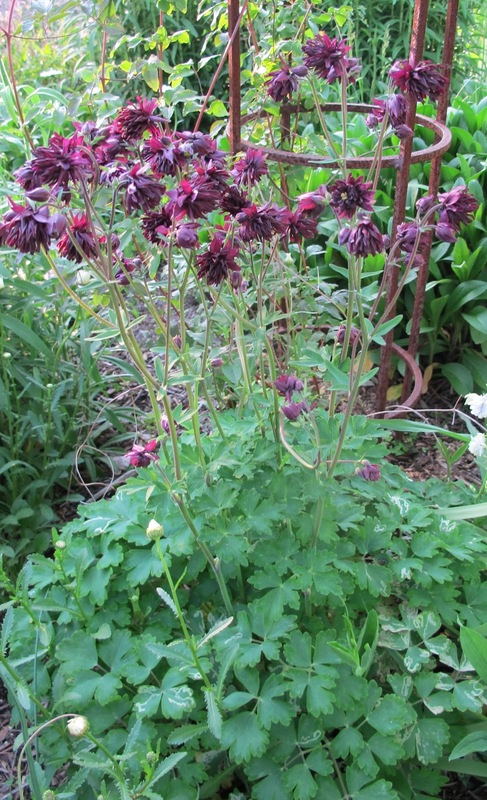 I won't be getting rid of these columbines with frilly flowers. After all, they really are old varieties, heirloom even, not like some of those new-fangled frilly flowers that have just started showing up in garden centers. I don't as a rule buy those. 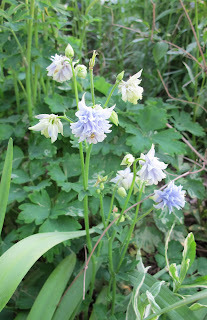 I just want more single-flowering, plain columbine for my garden. Preferably yellow. I've added them to my shopping list which grows longer every day. Look out garden centers, here I come. Love your garden names. Sometimes it takes time for just the right name to present itself. 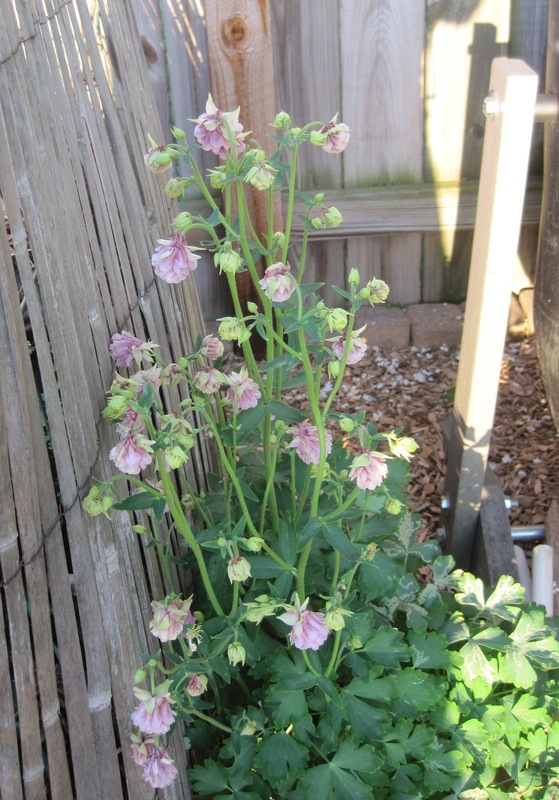 I have columbine that has reseeded itself in my garden and I love that they grown in unexpected places. But they are pretty and unexpected, easy care frills. Enjoy them. I see you as a coneflower woman. I've got a gazillion yellow single ones....they're fragrant, too! Would be glad to share. Sorry I'll miss your talk at GWA regional...I'll be at the Floriade in the Netherlands & the Keukenhoff! Carol, the Indiana native columbine is beautiful, but grows best in moist ground. And it's yellow! Carol, single yellow columbines is almost about all we can grow here in hot Austin. I'm sure your garden buddies here could send you a few Hinkley's Gold columbine, very drought tolerant, with a lovely long tail. And I for one am envious of your frilly columbines! I allow them to self-seed as well, but select for blues and purples. Black Barlow is a good one, really a deep purple, but it is the blue ones like your volunteer that really make me swoon. I dearly love the native, orangy-red and yellow columbine. It's very quirky and delicate (but not so much frilly, imho.) It appears in unexpected places throughout the garden. If my plants have set seed by then, I'll bring some to the May bloggers' fling if you want them. The one problem with being a good mulcher is one doesn't get the good volunteers. I have to actually collect seeds heads and start them in flats. That Blue Tower is to die for. You may not be a frilly woman, but our gardens don't have to reflect ourselves exactly. Good thing, or mine would look tired all the time from chasing after 4 little kids that all belong to me, somehow ;-) Personally I love flowers with lots of petals and ruffles. Maybe because I keep my interior decorating tranquil and my clothes simple, so it's fun to be extravagent in color and shape in the garden. Good luck finding your cheerful yellow columbine!